The NCAA women’s tournament bracket is out, and the Connecticut Huskies have a 52 percent chance to capture their 12th national championship and seventh undefeated season under coach Geno Auriemma, according to our March Madness predictions. This would be their fifth championship in a row and their third championship since last losing a game of any sort, on Nov. 17, 2014 — 847 days ago. If they win this tournament, that run will extend to over 1,000 days before they have another chance to lose next fall. The Huskies’ chance of winning this year’s tournament is not what it has been in the past, though. It’s well down from the 70 percent chance we gave them at the start of the tournament last year, and the 74 percent chance we gave them the year before — both of which, to be honest, felt a little low. This year, there’s good reason to think they really do have a lower probability of winning. After losing team stars Breanna Stewart, Moriah Jefferson and Morgan Tuck — who were the first, second and third overall picks in the WNBA draft last year — it would have been reasonable to expect their performance to drop a bit. And it has — though the Huskies managed to stay undefeated, they haven’t been quite their dominant selves. They carried a 75-game win streak into this season, having won every game by double digits. But they opened the year with a 2-point victory over Florida State (who’s now a No. 3 in its region) and two other wins this season have come by 6 and 3 points — the latter to unranked Tulane, whom they had beaten in January by 44! 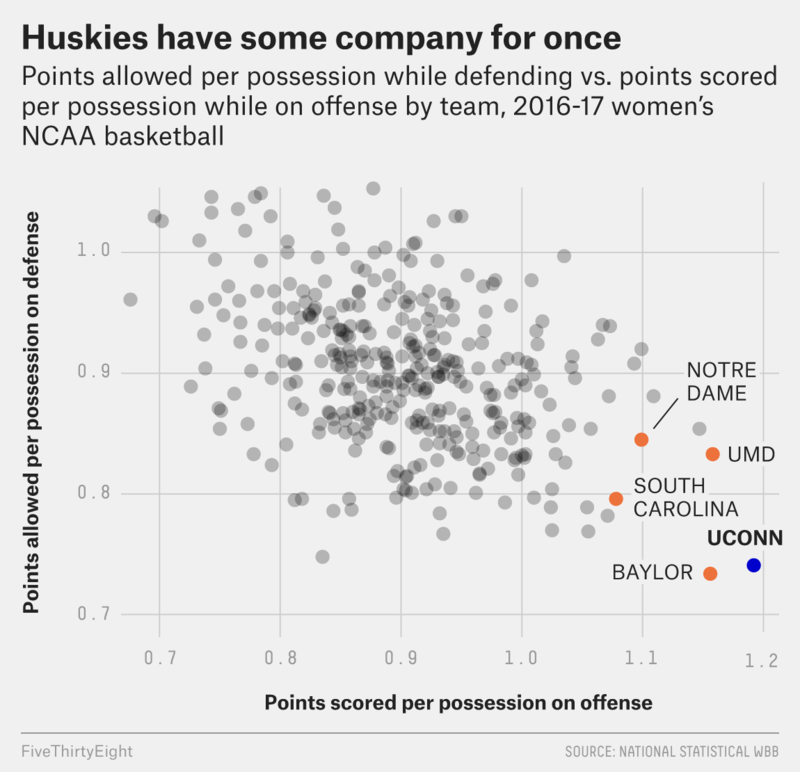 The Huskies are scoring fewer points per possession on offense and allowing more points per possession on defense than they did a year ago — though they are first and second, respectively, in those categories this season anyway. Their biggest obstacle is probably that some of the other contenders are stronger than they have been in the last few years. Baylor (23 percent chance to win, according to FiveThirtyEight’s predictions) is the next strongest team on paper, and the Lady Bears are in UConn’s neighborhood for both offensive and defensive efficiency — although they have looked vulnerable of late (such as when losing to West Virginia last week). The Huskies have played all three other No. 1 seeds (Baylor, South Carolina and Notre Dame) this season and won all three games by 11. Another threat might be No. 3 Maryland, who is in UConn’s region, have had a UConn-class offense this year and have only lost to the Huskies by 6 and 10 in their past two meetings. Two vanilla losses may not look like something to hang your hat on, but against this powerhouse — even in its mildly weakened form — that’s about as good as it gets.